Hot and tired from a three-hour drive inside a trailer behind a pickup truck, the 600-pound English Charolais calf was content to lay on the grass behind a south Houston building while a team of technicians worked on its hind legs. Could you pass a driving test on this street? This is very confused for me how can a calf have old legs and new legs also? They study and tooked a lot of photos of the calfs legs to examine it. This is cute. I think animals deserve the same treatments as humans. We are all equal in this world and I believe we should help others. Honestly what makes us any better than others. It just gives you a great feeling knowing you've made the world a little better. This story is truly beautiful and and inspiring. It's nice to see that people care that much about animals such as myself. 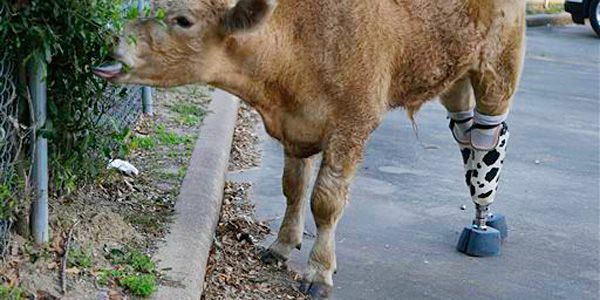 Giving that calf the ability to walk is a miracle. I think that is is really cool they do this. They are making it so the calf can still walk and have a normal life. Everyone deserves to have a normal life. It's cool to see how if there are problems with health or anything people can fix it. Even with animals so many animals have disabilities and to see that you can put fake legs on a cow is pretty amazing. The story is about a calf that got frostbite from being out in the cold weather. They have to amputate his back legs and give him prosthetic legs. It was a very expensive thing. It will help the calf because he has four legs. This story is about a calf named Hero, that had two old legs and two new legs . He got prosthetic legs. He got a very bright future right now. I hope he helps those special needs children . He got frostbites being in the cold weather. The story is all about a calf that got frostbite from being in the cold. They put prosthetic legs on his back legs. I think they had lots of cash to buy the prosthetic legs for the calf. I feel bad for the poor thing. Hero, a 15 month old calf, was fitted with prosthetics on her two hind legs. She suffered from frostbite and had a portion of both her rear legs amputated. She was rescued by Kitty Martin, a retired veterinary assistant, who spent nearly $40,000 on her prosthetic legs. 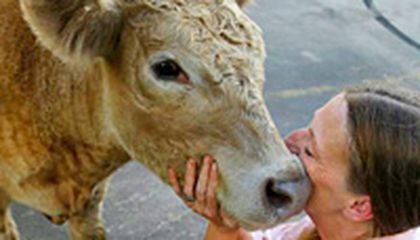 She is hoping that her cow can be used as a therapy animal for wounded veterans or special needs children. Hero is so lucky that Kitty Martin took on her case and saved her. It seems crazy to spend so much money on a cow, but if she can help veterans or special needs children, then it's money well spent.